While this isn't a true ancestor recipe... it's one that my children enjoyed, and now my grandchildren, enjoy each time they are made! Make them once... and you'll never forget the recipe! Preheat oven to 325-degrees Farenheit. Mix ingredients well in a medium bowl. Flatten cookies with a fork. 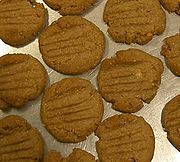 These are absolutely the best peanut butter cookie you'll ever eat!! !